Over 1,500 new rooms opening throughout 2018. Clayton Hotel Aldgate, London, with 212 rooms, is scheduled to open in December 2018. Additional 1,070 rooms added to pipeline in 2018 in London, Birmingham, Manchester and Bristol. €10.8m was invested in capital refurbishment across all areas of its hotels with 823 rooms refurbished in the first half of 2018. Agreement reached, subject to Board approval, to extend Ballsbridge Hotel lease in Dublin until March 2020. The Group have signed an agreement to lease a new four-star Maldron Hotel to be built in Manchester. The construction of the hotel is subject to the receipt of planning permission from Manchester City Council. It is expected that the hotel will open in the first half of 2021. Demolition of the Tara Towers Hotel will start in the final quarter of 2018 to make way for a new 140-bedroom Maldron Hotel Merrion Road, 69 residential units and an underground car park. Dalata, Ireland’s biggest hotel group, is to open a new hotel in Manchester, it revealed as it release its first-half results for the year. The Group also called for the retention of the special 9pc VAT rate for the industry, amid calls in some quarters for it to be raised to 13.5pc in the upcoming Budget. “I am monitoring the ongoing speculation about the possibility of the VAT rate in Ireland for hospitality services increasing from 9pc to 13.5pc. I believe that the reduction in the VAT rate has been hugely positive for the tourism industry and has been a very significant factor in the a dditional 79,1001 jobs created in the sector since the lower rate was introduced in July 2011,” said Dalata CEO Pat McCann. 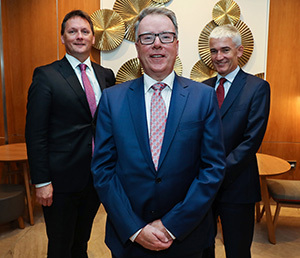 Mr McCann told Travel Extra that he was hopeful – given the background in the sector of Taoiseach Leo Varadkar and Finance Ministers Paschal Donohoe and Patrick O’Donovan, that the 9pc rate would be retained, as the exchequer hasn’t taken a hit in the VAT take, which has reason. He added that the suggestion of a two-tier VAT system for bigger and smaller hotels would be “impossible” to implement. The Group has been pushing strongly into the British market, and said trading in hotels across the water “has been mixed but broadly in line with our expectations given the challenging market conditions in some cities” but said its hotels in Cardiff, Manchester, Birmingham and Leeds “all outperformed the market”.